Within the pages of former NFL player Keith Jackson’s book, Your Illness is Not Your Equal ($11.49, paperback, 9781545635445; $5.99, e-book, 9781545635452), readers will find the miraculous and encouraging story of the author’s paralysis in both arms and legs and was told he would never walk again. Also diagnosed with prostate cancer, Jackson was unsure if he could ever be healed. Through his faith in God and believing in His promises, he was declared cancer-free. “God used my physical illness to bring me into a deeper understanding of who He is, and how He can use many methods of healing a person,” said Jackson. Keith E. Jackson, MFT, a 2015 winner of the Christian Author Award, received his Bachelor of Arts degree in Psychology from the University of Arizona. After graduating, he played in the NFL with the San Diego Chargers. He has written three additional books: Walking in the Way Day by Day, Changing Your Paradigm to the Christ Mind, and Releasing the Prisoner Within. Xulon Press, a division of Salem Media Group, is the world’s largest Christian self-publisher, with more than 12,000 titles published to date. 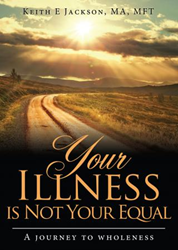 Your Illness is Not Your Equal is available online through xulonpress.com/bookstore, amazon.com, and barnesandnoble.com.